Recomended transit to be built in the next 15 years, from pg. 10 of the staff report [PDF]. 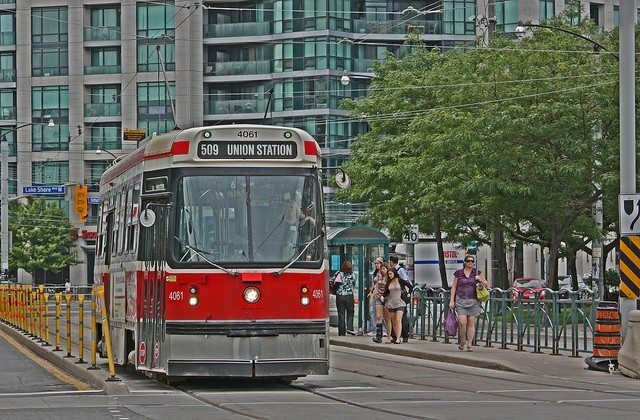 Toronto’s City Planning Department released a major update on rapid transit network plans on March 3, and the information will inform the city’s transit debate for the near future. The report will be discussed at the Executive Committee on March 9, and then at Council on March 30. Although there are over 400 pages, much of the material (attached as appendices) has already been published. Council must now digest the staff recommendations available at this time. Eventually, as part of the Official Plan, Council’s decisions will guide development for decades to come. But this is not the final, definitive version with priorities of various projects nor a discussion of how they will be financed. That will come in June, and it promises to be a long and challenging debate. Here’s where we’re starting from. Also included is a review of work already in progress on the so-called reset of Waterfront transit plans from Long Branch to Woodbine, but detailed work on this has not yet begun. The first challenge will be to consolidate over two decades’ worth of proposals and priorities into one coherent plan. Some routes, such as the Jane LRT, the Steeles BRT and an unspecified Sheppard East rapid transit service, are not discussed in this report. The King Street transit priority corridor, included as recently as the February round [PDF] of planning presentations, has fallen off of the map because it is not considered to be rapid transit. Photo by Loozrboy from the Torontoist Flickr Pool. Ever since the 2014 election campaign, John Tory’s SmartTrack scheme has been praised by some as visionary, but criticized by others as ill-conceived and impractical. Until detailed studies began to appear, the debate had little technical backing, but a lot of mayoral swagger and easy dismissal of the naysayers. 1.a. Review the approved environmental assessment for the Eglinton West LRT extension from Mount Dennis to the Mississauga Airport Corporate Centre (MACC) and Pearson Airport to optimize design, and remove the heavy rail options on the western corridor from further consideration. Because the Eglinton Crosstown LRT is now a Metrolinx project, their staff will report in June on an “optimized” version of what is now called the “Crosstown West” LRT. This will include comparison of various arrangements including stop locations and possible grade separation. Who will pay for this extension is not clear, but it could be a “shovel ready” candidate for stimulus funding if only the politicians can decide just what was to be built. The Metrolinx study of how GO’s Regional Express Rail (GO/RER) and SmartTrack would co-exist settled on four possible configurations of service design and infrastructure requirements. Two of these require substantial investment for SmartTrack over and above what GO already plans for its RER network, and this includes some intrusive construction and property requirements if SmartTrack is to have its own dedicated track. 1.b. 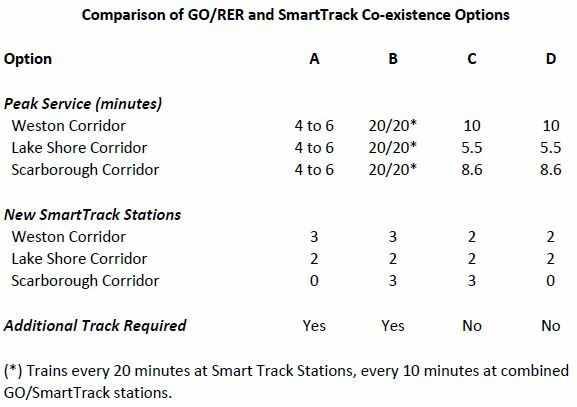 Complete the analysis for SmartTrack/GO RER integration options C and D, and remove from consideration the Separate and Parallel SmartTrack option, option A and option B.
Ontario’s “contribution” to SmartTrack consists of building the additional infrastructure needed for its GO/RER service, and only three new stations are included in the GO/RER budget (Mount Dennis, Caledonia and Downsview). Anything beyond that is considered a SmartTrack cost. Moreover, some GO/RER work such as grade separations will trigger utility relocations and other changes, and the cost is partly billable to Toronto. There is $2.6 billion “committed” by Ottawa, but this will come from the 10-year pot of infrastructure spending, not as a separate revenue stream. Toronto is clearly trying to minimize the capital it must expend to make SmartTrack a reality, and is taking advantage of whatever surplus capacity might exist on GO after the RER infrastructure and service are in place. These cutbacks, however, mean that the “SmartTrack” actually under study does not provide the service or the ease of access originally claimed. Once a five minute service with more than 20 stations (over half of them new), SmartTrack is now a much less ambitious project. Scarborough city hall and town centre. Photo by Himy Syed from the Torontoist Flickr Pool. 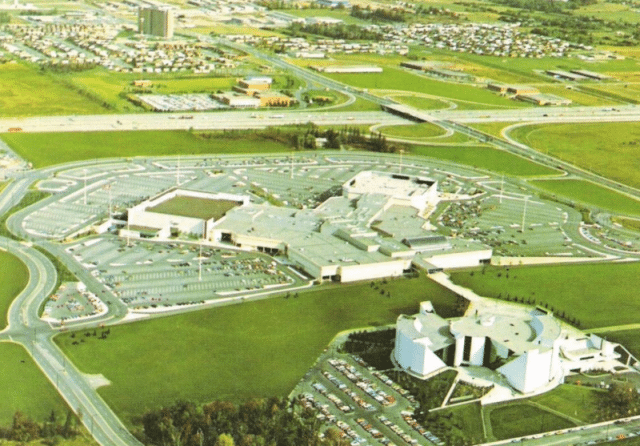 A future, as yet undefined, rapid transit service on Sheppard Avenue from Don Mills east with links to STC and UTSC. This plan, announced only in January, is already out of sync with plans for SmartTrack. The scheme depends on frequent SmartTrack service taking over the local rapid transit function while the subway runs express from Kennedy to Scarborough Town Centre. These problems have not been acknowledged or discussed in the City’s report, and demand projections do not reflect the configuration of service and stations likely to be adopted. Demand models used a combination of the three-stop subway (Lawrence, STC, Sheppard) with a SmartTrack route having stops every two km and peak service every five, 10, or 15 minutes. The more frequent the SmartTrack service, the lower the peak demand on the subway line. 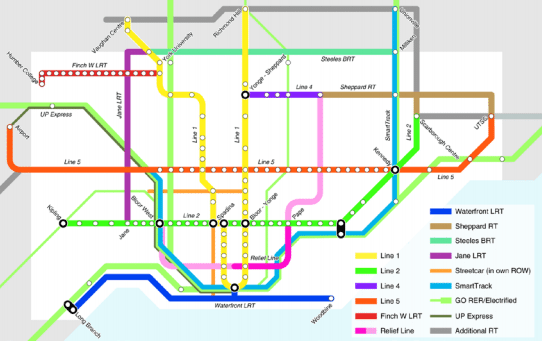 A one-stop subway, however, will not pick up at Lawrence, and it will receive less demand from the north if feeder buses go west to connect with SmartTrack. Conversely, if SmartTrack has fewer stations, or less frequent service, its effect on the subway will be reduced. Potential demands for the two routes are closely linked because they are after the same passengers. However, more subway riders will translate to more transfer demand at Bloor-Yonge as compared with direct-to-Union travel on SmartTrack. Updated demand modelling is essential to understanding how the two lines will behave. Funding of the new Scarborough plan is a bit of a shell game in which money originally earmarked for a 3-stop subway to Sheppard is partially reallocated to the Eglinton line, now called “Crosstown East”. Queen’s Park already has money on the table with their $1.48 billion (2010) commitment, and Ottawa has pledged $600 million. Whether the Crosstown East LRT could be accelerated as a “shovel ready” project remains to be seen. The real question is whether various governments believe more strongly in economic stimulus and quick spending on transit, or prefer to continue debate over goodies for preferred politicians and constituencies. Scarborough MPP Brad Duguid, minister of economic development, said that if anyone tries to cancel the subway, they’ll do it over his dead body. This explains the contortions undergone by planners to retain some form of the subway, even with a single stop, in the transit plan. A lot has been said about the future development of the Town Centre planning district, but the transit plan is notable for how it starves STC for connections to the wider network and especially by the absence of an east-west link through the district. This would have been provided by the Scarborough LRT line from Kennedy to Malvern, but that option is completely off of the table, and it seems to be political suicide for anyone to mention the LRT. Planning staff have also rejected a proposed spur from the RER/SmartTrack corridor east through STC roughly along the alignment of the existing SRT. This would provide a direct link from STC to downtown, but would starve the rail corridor north of Ellesmere for service. For this and other reasons, the spur proposal will not be pursued. Buried in the appendix on Transit Network Analysis is an examination of the degree to which various options contribute to making jobs in Toronto more accessible, as measured by travel time. This can occur because new stops serve major job concentrations, or because they serve residents previously living in transit deserts but now close to good service. The Scarborough transit plan is touted mainly for what it does for the Town Centre, but the LRT much farther south makes an important contribution that should not be ignored. The subway alone is only part of the solution. 2.c. develop recommendations to integrate the proposed optimized Eglinton East LRT into the University of Toronto Scarborough Campus secondary plan; and identify areas in need of an Avenue Study to facilitate intensification along the proposed LRT corridor in consultation with the Toronto Transit Commission, Metrolinx and the University of Toronto. 2.d. report to the June 28, 2016 Executive Committee on part c above, along with a recommended preferred corridor and alignment, and number and location of stations for the Scarborough Subway Extension. In other words, the number and location of stations for the subway are not yet settled, and this begs the question of a final, consolidated configuration for both the subway and SmartTrack. 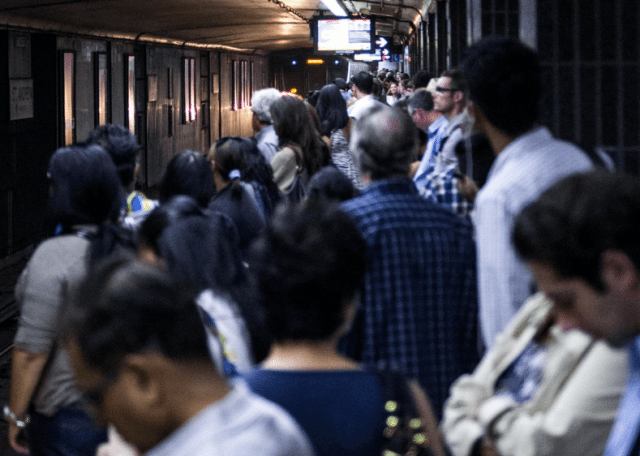 There are three possible segments for a Relief Line whose purpose, as the name implies, is to reduce demand on the Yonge Subway and the Bloor-Yonge interchange. Although it is shown on the map as a large, pink “U” running from Sheppard and Don Mills through the core and back out to Bloor and Dundas, all of the demand projections cited in the report are based only on the “little j” from Pape and Danforth to the core. The western and northern extensions are shown in light pink, the only case on the map of transit plans where parts of a line are implied to be beyond the 15-year scope. …by 2041, it appears that no combination of the Relief Line and SmartTrack reduces ridership below the capacity of the [Yonge] line. A related problem is the capacity of Bloor-Yonge station not just for the throughput of passengers, but for accommodation of transfer traffic that originates mainly on the Danforth leg of the subway. The TTC has a very complex $1 billion proposal to expand the interchange, but if the transfer traffic could be diverted elsewhere, this cost and the associated construction upheaval could be avoided. Metrolinx has projected a substantial drop in demand at this location with the “long” version of the relief line in their Yonge Relief Network Study. This is not even mentioned in the analysis of Relief Line travel because it looks only at the “short” version of the route. Photo by peruse from the Torontoist Flickr Pool. 3. City Council approve Pape to Downtown via Queen/Richmond as the preferred corridor for the Relief Line project and request the Chief Planner and Executive Director, City Planning in consultation with the Toronto Transit Commission to report the preferred alignment and stations to the June 28, 2016 Executive Committee. Examination of the background reports reveals that there was much to recommend alternatives to this plan including the benefit of swinging south to serve the Great Gulf (Unilever) site at the Don River, the higher concentration of jobs on a King/Wellington alignment, and the ease of western extension from King/Wellington to connect with a proposed new GO terminal for its northwest corridor services near Spadina and Front. The overall scores for both the King and Queen alignments were identical, all things considered. One issue raised is the matter of the Don River crossing from the Great Gulf site at Eastern Avenue rather than at Queen, an option with an estimated $400 million premium. However, depending on the outcome of SmartTrack and GO/RER design and service decisions, the absence of a subway connection by the Relief Line could hobble development of the Great Gulf site. The Relief Line is one that most politicians wish would just disappear because it is so expensive, and it appears to be so far away from their constituents. Oddly enough, they understand the idea that rebuilding the Gardiner Expressway “downtown” benefits suburban motorists, but seem unable to grasp this concept as it applies to transit. 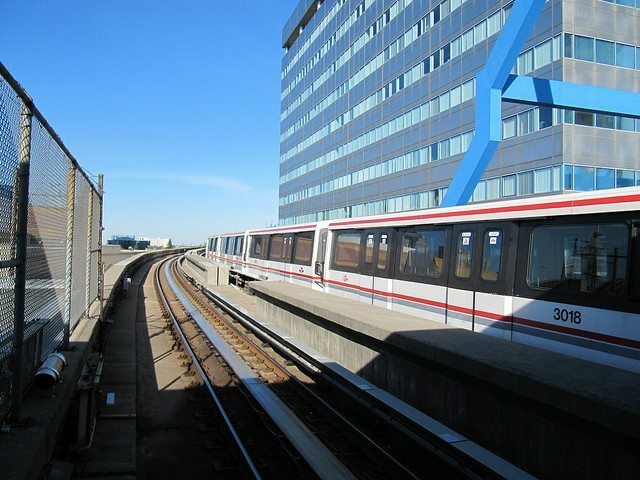 Capacity from riders diverted to the Vaughan subway extension when it opens late in 2017. His claims run aground on all counts. The Yonge line already runs with TR trains (the one-piece trains with open gangways from car to car) and their extra capacity has already been claimed by existing riders. The Vaughan extension will remove slightly more than one train’s worth of demand from the peak point on the Yonge line. In the past the TTC has overstated the potential to stuff more trains on the line, with a capacity bump of 36 per cent or more. That would require one train roughly every 105 seconds, a level below what the TTC is now aiming for and considers achievable (about 110). Seven car trains are no longer in the TTC’s fleet plan, and certainly not in the short term. Although they would just barely fit into the existing stations, there are challenges at other points–notably in the maintenance yards and buildings which have been designed for six car trains. All of the anticipated capacity that is in the pipeline is required just to handle the backlog of existing demand plus growth. This is shown both in the June 2015 Metrolinx report and in the demand modelling for the 2016 city study. Photo by Andrea Zaratin from the Torontoist Flickr Pool. How would Exhibition Place and Ontario Place redevelopment be served by a line that hugs the railway corridor far north of Lake Shore Boulevard? What route is most appropriate from Dufferin west to Sunnyside? Should the route stay south of The Queensway until west of Sunnyside both to serve the waterfront parks and to avoid the congestion on King Street and at King-Queen-Roncesvalles? What transit configuration will exist near Park Lawn road if there is a new GO station there, and how will this fit with the large-scale condo developments at the Humber Bay? Is it practical to take an LRT west of Park Lawn given constraints on the road width and the likely level of demand from there west to Long Branch? How soon can the eastern waterfront line be built, especially the expansion of capacity at Union Station? When is the likely development of the Port Lands and new LRT service on Cherry and Commissioners Streets, and a possible link to the Great Gulf site? What demand would be served by taking the route east as far as Woodbine Avenue? These and many other issues will be examined in a study that is about to begin. An update will come back in June 2016 to Council, but the end date is further off. Photo by fotograf.416 from the Torontoist Flickr Pool. An issue that will become more complex as the network evolves is the relationship of the TTC surface network to various rapid transit lines. When there is only one new route to consider, the TTC can arrange (the word “gerrymander” might also be appropriate) its routes to force-feed the new service. Examples of this can be found at every subway terminal, and the arrangement is maddening to riders whose trips do not follow the classic downtown-commute path and timing. In Scarborough, there will be a conflict between taking riders to the Town Centre which is supposed to become a major employment node, versus the SmartTrack stations (whichever of these survive into the final design). If local transit is to serve “local” travel (including the substantial number of trips within Scarborough that cross the 401), the surface network will have to serve more than one trip pattern and it will be difficult to make everyone happy. Similar problems will arise along the Eglinton Crosstown line. The permutations will be even more complex if GO/RER takes on a substantial role for inside-416 travel. To further confuse the situation, Metrolinx has a Fare Integration Study underway which is likely to propose making longer trips, and especially trips that use rapid transit lines more expensive than trips on the regular surface network. To date, rapid transit means only subway and GO trains, but one can easily imagine LRT being pulled into that definition. Strangely, BRT is not mentioned as a “rapid transit” option. City Planning and the TTC are working on a report regarding the implications for Toronto of a new fare structure. The political implications of building all of these new rapid transit lines but then charging people more to ride the subway and LRT network are quite substantial given the long history of resentment in Toronto’s suburbs about second-class transit and the elimination decades ago of the zone fare. 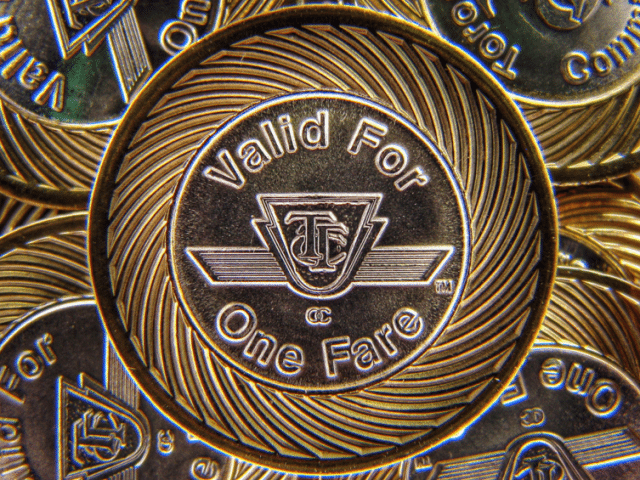 Existing fare boundaries present two substantial annoyances: a small proportion of commute trips take riders a short distance across the 416/905 boundary but require a double fare, and there is no “co-fare” allowing discounted riding for a combined GO-TTC journey. Rather than dealing with these explicitly, Metrolinx may propose tearing apart the entire fare structure with considerable implications for fares paid by all TTC riders. To date, they have avoided any discussion of specific effects preferring to talk in generalities about “fairness.” The fun will start when they publish real-life scenarios.